Discussion in 'iMac' started by julius66, May 12, 2008. 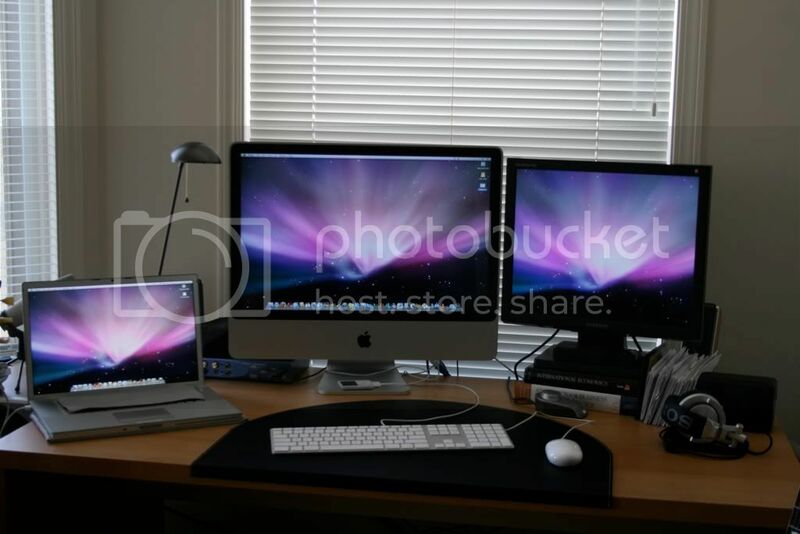 I've decided I want to get a 24" iMac. I plan on using it with the eyetv hybrid as a combo awesome computer and hdtv. Here's my question: should i Go for the NEW 2.8ghz at $1699 (w/ student discount) or the Refurbed 2.8ghz extreme for $1599?? Looks like they both have the same graphics card, the refurb comes with a 500GB harddrive vs. the new one at 320GB. Is the processor different? I know the new ones are penryn based, but is the 2.8 extreme in the refurb faster? They are about the same speed. I would get the EyeTV 250 plus instead of the EyeTV hybrid. The 250 plus has hardware Mpeg2 encoding, so your computer CPU has minimal usage during recording. If you want to convert or save the files created to MP4 for use on AppleTV or an iPod, get a Turbo.264 in addition to The EyeTV. It will handle the grunt work and leave your CPU free to do other stuff. I have this setup on a Mac Mini. You'd never know it was recording or encoding MP4's. I was trying to decide between the same machines as you and ultimately I chose the new 24" 2.8 model. It has a smaller hard drive but better front side bus and 6 MB cache and 800 mhz RAM which is better than the Core 2 Extreme. I could not be happier with my choice. I haven't added any more RAM yet but this baby is handling all of my design programs with ease. The refurb was tempting but I'm happy with my brand new imac. Hope this helps. Why not save a little money? Get the refurb w/ Apple care. Refurbs are just as good [usually], and will do everything the new one will just as good I'm sure. Even if it doesn't, I doubt you'd notice. But hey, up to you. Just another Mac users opinion! So what did you end up buying? Still deciding. I like the 3.06 model a lot, just not sure if I can justify the extra 500 bucks. I'm thinking refurb 2.8 extreme w/ apple care might be the way to go. I went the same as Schmoopy for the same reasons and the 8800 card. the 2.8 runs cooler and was more bang for the buck. Been looking at this forum and others for a couple of weeks now and finally pulled the trigger on my next Mac. I don't play games and expect to keep it a long time. So went for the fastest processor and best desktop video option. I'd like to believe that the NVidia drivers will be improved, but right now the differences are too stark for desktop apps. The 500GB HDD is going to minimize any media growing pains along with the two MyBook 500GB drives I have laying around. gehrbox, hope you love it. the only glitch I had was migration assistant but all is well. even got use to keyboard. I hope you already made a decision here as it looks like the refurbed 2.8GHz model is sold out. Still haven't pulled the trigger. Waiting on my stimulus check. I guess I'll be going new, probably the 2.8 model with the 8800GS if I can justify it. I know what you mean. The day the stimulus check hit my checking account I ordered mine. They're coming and going at the refurb site. I bought a 24" 2.8 Extreme on there last night, and it's already packed and ready for shipment. Just have to keep checking every couple of hours or so. I bought my first Mac ever, a 17" iMac, less than 3 weeks before they converted to Intel chips. It's done everything I've asked of it and more, so I didn't have a problem getting the previous model this time. Did it! Brand New 24" 2.8Ghz 2GB ATI 2600. This baby is niiiice, and the screen looks great, no dead pixels, no banding. Cool. Now you need to update your footer. I just came home with a new iMac 24" 3.06GHZ, 2GB, 500GB, NVIDIA. I am using it for the first time now. It's my first Mac so I have a lot to learn. They have the 24" 2.8 refurb's back in stock.